The information about the P gun project is taken from David Birch's "Rolls-Royce Armaments" available from the Rolls-Royce Heritage Trust at PO Box 31, Derby DE24 8PJ, UK. This is an excellent book which also includes detailed information about the R-R 40 mm and .5" guns. In the summer of 1942 the Panzer VI Tiger tank emerged on the scene and it became evident that the 40 mm Class S gun, fitted to the Hurricane IID then in service in North Africa, was not powerful enough to penetrate the thick armour. The Class S was only capable of penetrating around 50 mm, but it was considered necessary to have a weapon able to penetrate 75 mm of armour plate. After calculating what would be required to achieve this (allowing for an additional 100 m/s velocity for the aircraft speed), the Air Staff issued a request in May 1942 for a 47 mm airborne anti-tank gun which would fire a 4 lb 9 oz (2.07 kg) AP shot at 2,650 fps (808 m/s). It was required to fire at not less than 60 rounds per minute. Vickers were contracted to design and manufacture the ammunition. 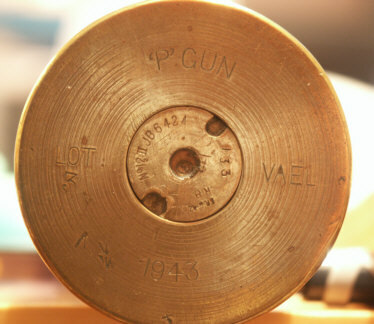 They produced a conventional rimmed straight case measuring 326 mm long, with a rim diameter of 59.7 mm and a body diameter above the rim of 53.5 mm. The projectile was also to conventional British standards, a plain steel shot with no HE content. Overall cartridge length was 474 mm. Three firms were asked to develop guns; Vickers, Rolls-Royce and the War Office Design Department. The project was designated the Class P gun and the competing designs were known as the PV (Vickers), PR (Rolls-Royce) and PC (for the Chief Superintendent of Armament Design in the War Office). Complete information about the three projects does not appear to have survived. The PR gun was designed with two different barrel lengths, a 70-calibre barrel (with which the muzzle velocity was calculated to be 2,675 fps or 815 m/s) which was about 4.3 m long overall, and a 52-calibre version. The gun was belt-fed and used a long-recoil design; the weapon recoiled 66 cm on firing, generating a peak recoil of just over 2,000 kg. The PC gun weighed 250-270 kg and recoiled only 30 cm, thereby generating a stronger peak recoil of 3,560 kg. This was magazine fed with two alternative designs; a 30-round flat box lying across the gun's body, and a 34-36 round drum wrapped around the rear of the gun. Overall length was 4.5-4.7 m respectively. No information is recorded about the PV gun. The length of time required to develop new weapons was such that the 6 pdr Molins gun was also considered, but its size counted against it. A smaller and less powerful 57 mm Type GA gun and even a 12 pdr (70 mm) were projected instead. Penetration was estimated to be 100 mm and 120 mm respectively. It was noted that to penetrate much more than 75 mm the Class P would need to use tungsten-cored shot, which was not only in short supply but also had a more erratic performance, more likely to break up on impact against armour. 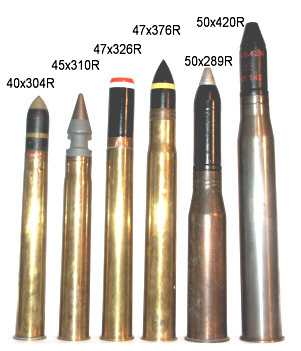 It is interesting to compare the 47 x 326 R ammunition with contemporary rounds. The closest British equivalent was the 3 pdr 2 cwt Mk 2 fitted to the interwar Vickers Medium tank, which fired a 47 x 351 R cartridge (slightly shorter than the contemporary Hotchkiss and Vickers naval 3 pdrs). Despite the the 3 pdr's longer case, its performance was considerably weaker and it was evidently loaded to a much lower working pressure. It was noticeable that during World War 2 the British employed very high operating pressures for tank and anti-tank guns (higher than the German equivalents, for example), accepting a lower gun life in the interests of maximum performance.